Using 'nature's own' calculator (i.e. your own ten fingers) is all very well, but things become tricky when an equation involves more than simply counting up to ten. And while your old pocket calculator from your school days (held together with sellotape, engraved lovingly with a tipp-ex pen) may still be stashed away in a desk drawer, your trusty old device may not be able to help you out when it comes to calculating motion time standards, cash flows, interest rates and so on. This is where Financial Calculator comes in—find out more in today's review. The Financial Calculator comes with all the functions you might expect: everything that has to do with basic calculating and arithmetic as well as other standard functions. The TVM (time value for money) is calculated using your entries regarding cash value, amount and length of periods, interest rates, etc. This calculation can be used for every parameter. Growing Annuity then tells you how much the cash flow – which flows in over a period of time – is already worth today. Growth Rate Parameter assesses payments. Growing Perpetuity – aka eternal pension – can also be found in the Easy Mode and allows you to include a growth parameter in the equation which will reflect the regular increase in payments (10%: 1st year 100 €; 2nd year 110 €; 3rd year 121 €; etc.). The Net Present Value (NPV) internal rate of return (IRR) can also be calculated. Credit receivers and home owners with mortgages will appreciate the Loan Amortization function, which is truly a useful tool. 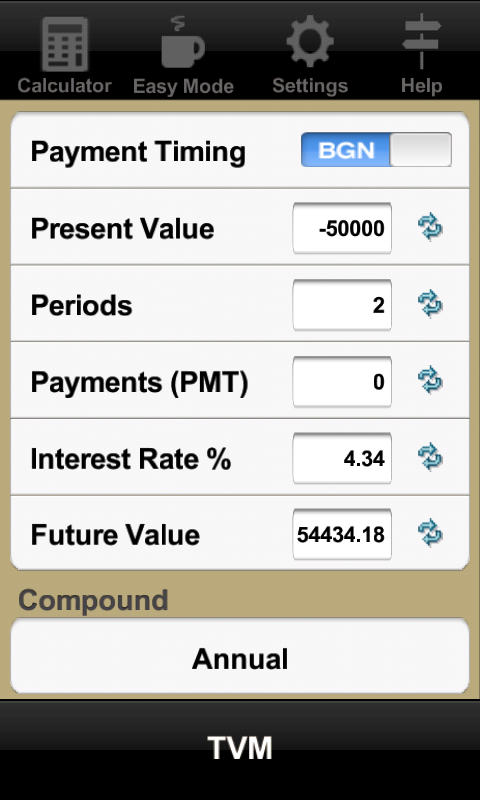 Simply enter the credit amount, interest rate, amount of payments due, time frame and interest calculation type and a table pops up containing information relevant to amortization, final value and interest payment. This convenient overview can be sent to you via email should you wish to have a copy for your files. Accuracy is what it's all about in the world of finance and Financial Calculator does not disappoint in this respect. Up to seven digits can be entered after a decimal point. 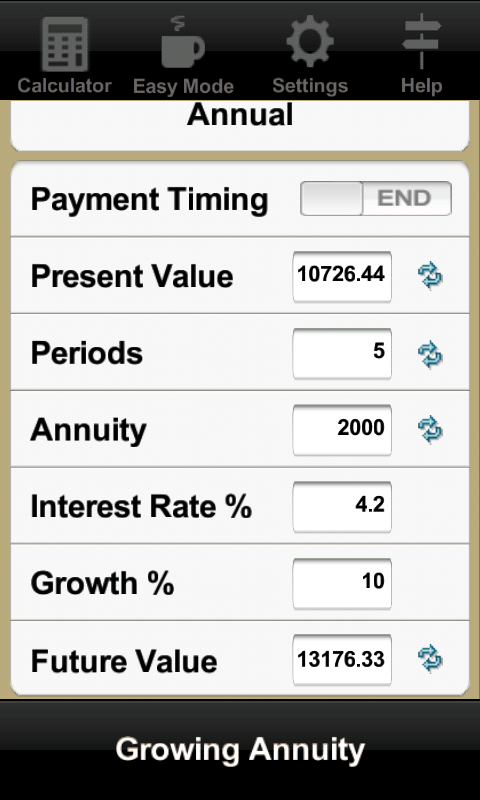 It's also possible to display the amount of payment due dates and annual interest payments. Financial Calculator also includes a Reverse Polish Notation function, a great option that can help you save a lot of time. Financial Calculator is a fully functional calculator that can help you save a lot of time. Figuring out a credit's amortization is much easier than when using Excel, for instance. My only critique would be that it isn't possible to export as .csv file, which would make sense if you're looking to import information to programmes such as Excel. 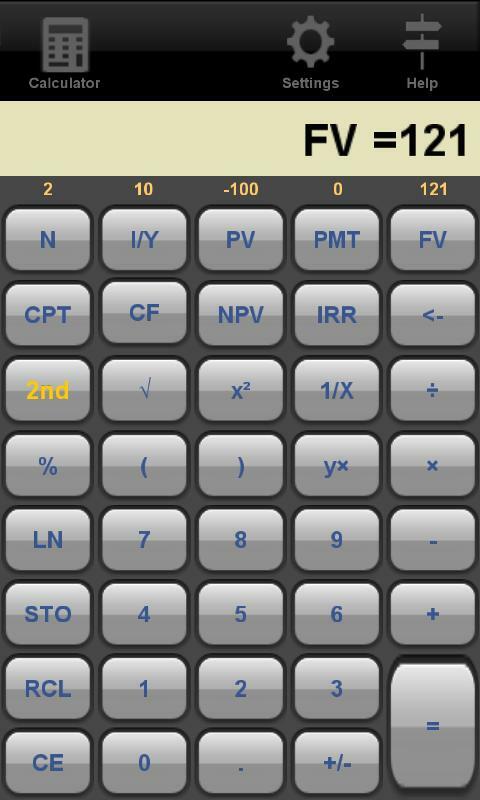 Financial Calculator is an exact replica of the version that exists for iOS. iPhone aficionados will rejoice, but I must warn you that important iPhone apps to Android comes with a few drawbacks. The controls are not intuitive, bordering on confusing. Let's say you wish to jump from one menu to the next and back to the previous one the programme shuts down. 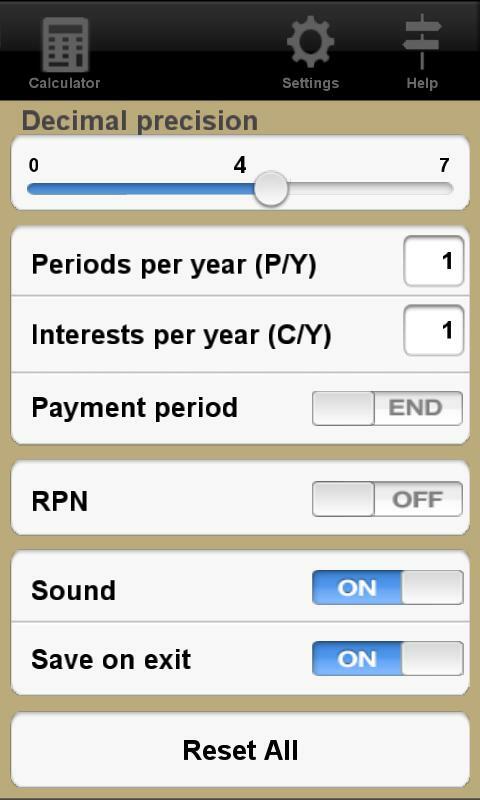 There are two 'done' buttons below the input mask in the cash flow function, but one of them brings you right back to the calculator mode. Aside from these two small glitches controls are pretty solid and the design is perfectly fine (iPhone fans will love it). Financial Calculator performed quite well on the Samsung Galaxy S2 in the sense that it's prompt save for when you first start up the app for which it needs 3-4 seconds. Financial Calculator can be downloaded for free but if you wish to keep using it after a seven day trial period it will cost you EUR2,99. A useful tool for accountants. Thank you for pointing this out, Joaquin! Remember, this is an advance financial calculator so you should know what you are doing. There is an easy mode for those not familiar with finance, so you can download the calculator for free and use it during the trial period. If it fulfill your needs, then you can purchase it.